Ein Gespräch mit Rana Sadik über ihr Konzept, ihre Arbeitsweise und Projekte wie Study for a Domiciled Gallery, kürzlich präsentiert im Museum für Moderne Kunst in Kuwait. MinRASY PROJECTS entwickelt und produziert Projekte, die von der Leiterin Rana Sadik konzipiert werden. MinRASY ist sowohl ein Akronym aus den Namen Rana und Samer Younis als auch ein arabischer Begriff, der in etwa "aus meinem Kopf" bzw. "von meinem Kopf aus" bedeutet. Kuwait feierte sein Goldenes Jubiläum der Unabhängigkeit und den 20. Jahrestag seiner Befreiung als die erste Serie künstlerischer Interventionen von MinRASY im öffentlichen Raum der Hauptstadt realisiert wurde. Mit den Interventionen sollte dem lokalen Publikum ein breites Spektrum an künstlerischen Ausdrucksweisen angeboten werden, die sich auf die fehlende palästinensische Community im heutigen Kuwait bezogen. Vier Jahre später installierte MinRASY das Wohnzimmer von Sadik in einem kuwaitischen Museum, um zu testen, ob regionale Museen Sammlungen von Bürgern und ortsansässigen Personen in ihre Programme einbeziehen oder regionale Sammler in die Beiräte von Museen aufnehmen würden. Ala Younis: MinRASY projects are GCC-centric exercises for artists, curators and museums to think about the politics that shape the life of the middle class in the Gulf: surprising a non-expert audience with a non-functional (or fictional) United States of Palestine Airlines  at Kuwait’s Travel Expo, or commissioning a nomadic museum of impossible objects to respond to the absence of Palestinians in Kuwait. How did you come to think of this practice? Rana Sadik: I think I am in a unique position where I can conceive a project and fund it. In a way there is a real sense of liberation that allows me the room to work the way I want to think. In 2011, committees in Kuwait were preparing to celebrate the Independence and Liberation of Kuwait. I wanted to intervene in this and commemorate those communities that were part of the nation building process, yet have been and continue to be written out of their country’s narratives/histories. I started to think about this in 2009. I was also thinking about USPA in Kuwait. The two came together in 2011. I like to explore and develop my interests with others. Engaging with others in thinking and talking about these ideas, and I prefer that these discussions happen in public spaces. These projects consume a lot of mental energy in their translation from ideas to projects, as well as in working with the feedback from those who receive the project. All this helps in developing my ideas. Ala Younis: The core of these art projects is always the idea. You don’t call your self an artist or a curator but you are an idea-maker. Rana Sadik: In reference to myself, I use the term director. I leave it to the receiver to formulate the nature of the input I am providing or the relationship that I have with them. My background is a bit different than artists; I feel I have developed my thoughts over a number of years that I have recently developed a practise for. Ala Younis: In the course of commissioning objects for the collection of MoMRtA - Museum of Manufactured Response to Absence , our collaborators were resistant to imagining another ‘Palestine’, a Kuwaiti version that had a role and life style that are different from the general Palestinian diaspora. Objects in MoMRtA were guided by a number of rules: not only did the objects have to be impossible or exaggerated, but also new, unique, manufactured in contemporary times, never mention Palestine by name, and respond to a memory of Palestinians in Kuwait between 1948 and 1991. There was little published material about this episode in history to work from but there was always something humorous about this process of research, communication and the resulting objects. Perhaps it was coming from the impossibility issue? From my perspective, as a Palestinian from Kuwait, a non-Kuwaiti, non-Palestinian citizenship holder, long term resident with no indefinite leave of stay, these projects are my observations and comments. I like them to unfold in public spaces. Ala Younis: In Incomplete Personal Archives: Travel Documents or/and Identity (2014)  you presented framed photographs of five passports that you’ve accumulated. None of which were from the two places you say you are from: Kuwait and Palestine. Rana Sadik: I had thought of this project for a long time, but there was no venue presenting itself as the right one, until we said we are going to Qalandiya International II. This project, Incomplete Personal Archives, takes from Qalandiya International II’s theme "Archives, Lived and Shared", and probes the recent trend of archive/research-based artwork. This work of 5-framed photographs was produced at John Jones in London. Ala Younis: I think your latest project Study for a Domiciled Gallery (2015)  responds to many of the questions you put forward. It contextualizes the MinRASY endeavours and your relationship to the political and art institutions of the region you live in. 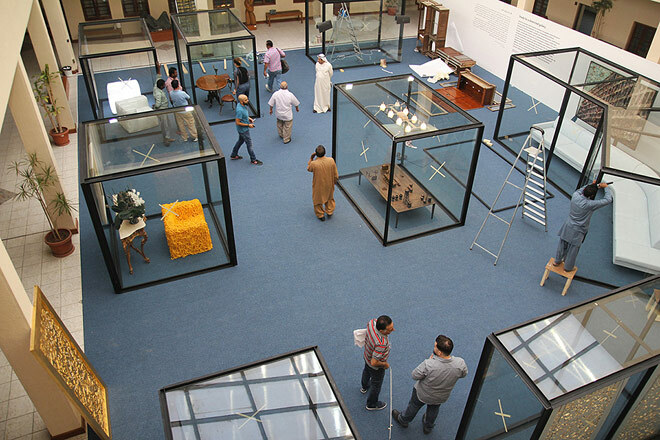 You moved the whole public part of your private space, your salon complete with its furniture, artworks and other acquisitions, to be displayed in sections in Kuwait’s Museum of Modern Art. The idea came to you following an International Museum Conference held in a museum in a gulf city, where you noticed the absence of artworks borrowed from regional lenders in the shown exhibition. You were asking why should individuals collect art in the Gulf? Rana Sadik: Collectors assume the responsibility of being caretakers. Museum-board memberships are highly aspirational for collectors, so collections are vehicles or ways. Here, a resident-collector does not have venues/outlets to show her/his collection; nor can s/he be part of a regional museum board or have a legal structure to protect their collection. Ideally, a project like MoMRtA should be endowed by now to a museum that has trustees. Ala Younis: How can one do what one does and also plan the future at the same time? Rana Sadik: MinRASY came at a time when I felt I had subjects to explore. I guess how we measure the distance to a future and how we process it is individual. Though these projects produce documents for future dialogues, they become meaningless in repetition, with the exception of MoMRtA, which will continue to debut as a particular intervention every time. United States of Palestine Airlines (2007), work by Khalil Rabah installed at Travel World Expo, Kuwait International Fair Ground, Mishref, Kuwait, 29.3 - 1.4.2011 as part of the public interventions in Kuwait program organized and produced by MinRASY Projects. A nomadic museum collection of commissioned objects that respond to the absence of Palestinians from Kuwait premiered in 2012 at Kuwait’s Museum of Modern Art under the patronage of National Council for Culture, Arts and Letters. An object in MoMRtA collection; "Fils" is an enlarged Kuwaiti coin, casted in 18ct gold, with a hole in the middle of it to reference the Palestinian qursh. Work by Rana Sadik, based on reproduced images of passports and travel documents, presented at Khalil Sakakini Cultural Center in Ramallah, as part of Qalandiya International II, 23.10 - 15.11.2014. Site-specific installation in the Museum of Modern Art (Kuwait) composed of the transported living room of Rana Sadik. Materials included steel, glass, and variable elements including artworks. Organized under the patronage of National Council for Culture, Arts and Letters, June 2015. MinRASY Projects ist eine Initiative von Rana Sadik für die Realisierung der von ihr konzipierten Projekte. Study for a Domiciled Gallery war eine ortsspezifische Installation im Museum für Moderne Kunst Kuwait, entstanden unter der Schirmherrschaft des Nationalen Rats für Kultur, Künste und Literatur des Staates Kuwait, 26. Mai - 11. Juni 2015. United States of Palestine Airlines auf dem Mishref-Messegelände, Kuwait; Tarek Ala Duwar am Sadek Roundabout Kuwait; Museum of Manufactured Response to Absence (MoMRtA) und Unplified, Museum für Moderne Kunst Kuwait; Beteiligung an der Qalandiya International; mehrere Publikationen wie z.B. Kuluna Lil Kuwait. Durch 28 von Künstlern im Auftrag geschaffene Objekte untersucht die Schau im kuwaitischen Museum Moderner Kunst die Geschichte von Palästinensern in Kuwait. Kunsthaus Hamburg, 8. Sept. - 1. Nov. 2015. Kuratorialer Text von Katja Schroeder und Fotos der Ausstellung.